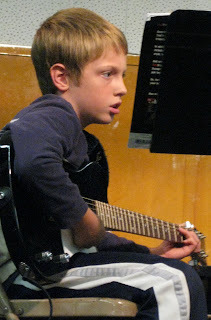 Today was a big first for us... the first guitar recital for our oldest son, Nathan! Six weeks ago he joined up with a class that was pretty far ahead of him, but he still managed to almost completely catch up to them, earning a "yellow belt" (just like in karate only for their guitar straps). At today's recital he played Jingle Bells, Ode to Joy, and Good King Wenceslas. The only song he couldn't catch up and learn in time was Yankee Doodle. And in typical Mom fashion, I walked into the room, saw Nathan on stage, and promptly burst into tears. I think it's a chemical reaction- I always respond in the exact same way whenever either of the kids "perform". The kids know it, and they still love me anyway. Generally they say something like, "there goes Mom again, crying", and give me a pat on the back. I was slightly horrified when I saw what Nathan was wearing... his warmest pants which are about two inches too short, and layers of long sleeve tee shirts which in a very broad sense could appear to match in a small way (they both have the color blue on them). This morning we woke to incredible sheets of rain flooding the street, and the boys were dressed in shorts and tee shirts. I made them change into "warmer clothes" before taking them to school, but I didn't really supervise it, and they bundled up in their warm jackets before I thought about what they might have under them. So basically Nathan got to rock out looking like he raided the lost and found for his "costume". Oh well. You win some, you lose most. We told Nathan that we were SO PROUD of him. And then he said, "You know what? I'm pretty proud of myself, too. You cried, didn't you Mom?" Guilty! Yeah Nathan! I've got a tear in my eye as well because I'm so proud of you. You rock!